The Surplus Store is open to University departments, state agencies, non-profits and the general public. Browsing and purchasing hours vary depending on who you are purchasing for. Specific times can be found on the Surplus Store page. New items are added to the store regularly, so check back often. Public auctions are held approximately six times a year and include live on-line bidding with Proxibid. All items are sold ‘as is’, ‘where is’. The University of Washington may add or withdraw items up to date of sale. Please contact the Surplus warehouse on sale day for availability of specific items. UW-owned phones are considered UW property just as with laptops, monitors, chairs, etc. Under most circumstances, employee purchase of a decommissioned UW phone is not permitted. The exception is purchase of a phone by an employee whose device will be enrolled in the UW Mobile Device Program. If you are a current UW employee who will be purchasing a decommissioned cell phone or hand-held device with the approval of your department, please submit our online surplus request form using the “delivery-to-surplus” form (even though the item will not technically come to us). List the item as “iPhone/ Android Phone (etc.) for Employee Purchase.” In the “comments” section, we need to know the original purchase date & original purchase price. The department head who has approved your allowance eligibility should also be the approver on the surplus request form in the “Approver ID” field. Please us the Teleservices budget number rather than your department’s budget number. We will then add the item to Surplus Store inventory and contact you directly with complete purchasing instructions. PLEASE NOTE: The UW Surplus office does not have any involvement with your phone plan, phone number, or service. Please submit the form listing only the phone or phones you will be purchasing yourself. PLEASE NOTE: YOUR SUBMISSION WILL BE HELD UP IF WE DO NOT KNOW THE ORIGINAL PURCHASE PRICE AND ORIGINAL PURCHASE DATE. Please do not call to issue payment until you have received the purchasing instructions email from the Surplus office. Ability and approval to purchase a decommissioned UW phone or device with departmental approval is allowed only if the item falls under the UW Mobile Device Program guidelines available here. These guidelines also address questions about keeping your same phone number, etc. If a UW employee wants to buy a UW-purchased cell phone because his or her department is upgrading their current phone—i.e. they have an iPhone 4 and it’s being replaced with an iPhone 5, and they want to purchase their old iPhone 4 for personal use—this is not allowable. Please note: ALL UWMC CELL PHONES are paid for through the Teleservices budget. Please submit the online surplus form using the Teleservices budget number and not the budget number of your UWMC department. 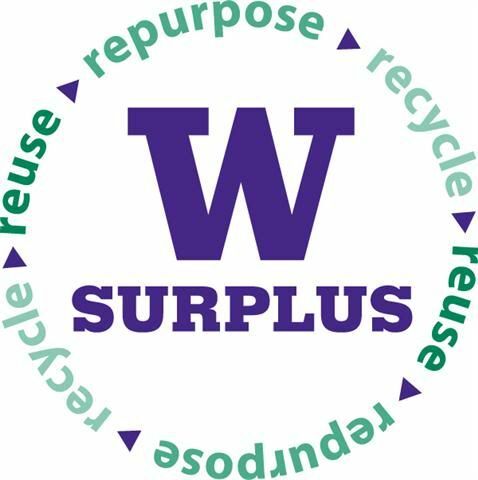 If you do not know this budget number, please call Eric Wahl at the UW Surplus office at 206-685-1573, who will provide it to you. The University of Washington is committed to providing access, equal opportunity, and reasonable accommodation in its services, programs, activities, education, and employment for individuals with disabilities. To request disability accommodation, contact the Disability Services Office at least ten days in advance at:206/543-6450 (voice); 206/543-6452 (TTY); 206/685-7264 (FAX); or dso@u.washington.edu. NEW! Saturday, April 27, 2019. 65.5’ Oceanographic Research Vessel: The Clifford A. Barnes! Closes 7pm Pacific, Monday, May 13, 2019. More timed auctions are on the way. Stay tuned! Nonprofit Organizations & Government Agencies: Mon, Wed-Fri, 8:30am-3:30pm & Tues, 12-6pm. University Departments: Mon, Wed-Fri, 8:30am-3:30pm & Tues, 12-6pm.